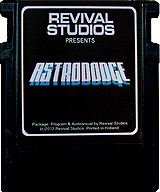 ColecoVision.dk presents: Astrododge © 2013 by: Revival Studios. Publisher and Year: Revival Studios, February 2013. Special for Astrododge: A hidden game. In astrododge, you control your ship and have to avoid the rogue asteroids for as long as possible. A point is rewarded for each asteroid that is dodged succesfullly. Picking up the bonus pickups will gain you massive points. Highscores can be uploaded to the internet so you can compare you score worldwide. Additionally there are tasks you can perform to will unlock rewards in the game. These rewards can also be synced on the internet so you don't have to unlock them all in one session. 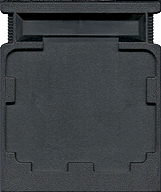 The game offers a single player mode as well as a 2-player versus mode. 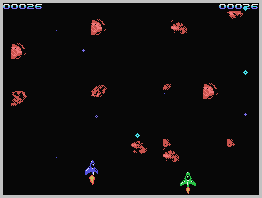 The latter is especially fun to play with a friend (or foe) as you both battle for the special pickups which zooming dangerously close past the asteroids on screen.! How to locate the hidden game. You have to fiddle around in the main menu, until you hear a special sound. After this, the hidden mode is unlocked and you can get the achievement after playing a game in this mode. High Score For The ColecoVision Version Of: Astrododge, Single Player. 1st XScore: 1st XScore: 1st XScore: 376 - December 06, 2014. High Score For The ColecoVision Version Of: Astrododge, Versus Mode. 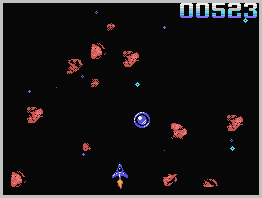 ColecoVision.dk Game # 110, Astrododge is last updated: March 23, 2019.